This modern church to the east of Ipswich town centre is far more interesting than it might at first appear. On this campus-like site you can read, in bricks and mortar, the struggles and triumphs of more than 200 years of Ipswich Catholic history. From Woodbridge Road the first sight is of an elegant essay in Early English gothic, the 1838 former church of Our Lady of Grace. 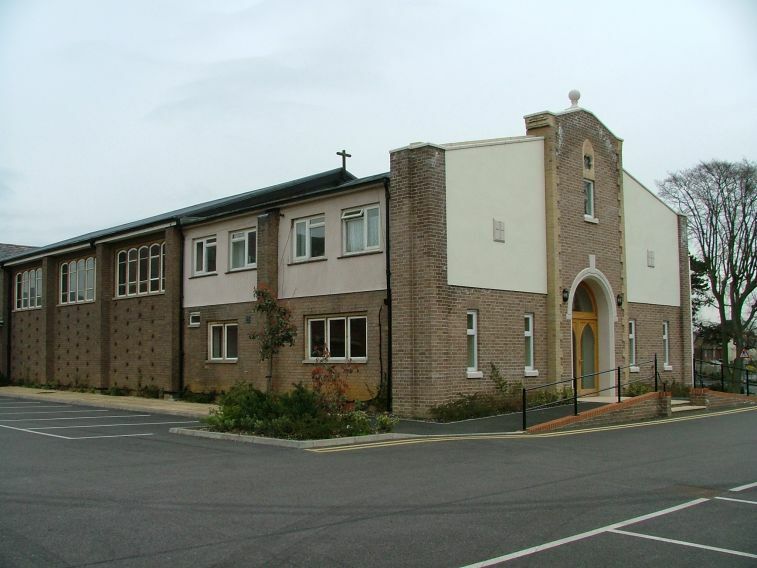 This is now the parish hall, and the L-shaped terraced buildings to the right of it are the Convent of Jesus and Mary. To the left of the hall stands the presbytery, actually a much older building, a fine 18th century villa. This was the original home of Father Simon, whose story you can read on the entry for the old church. A roundabout here is modern, because the site beyond the church has been recently and extensively redeveloped, as we will see. Walking past the presbytery, you enter what was once the large gateway of the former school of Jesus and Mary, which has now closed, its former buildings demolished in 2002. It had been built in the early 1860s by the architect George Goldie, perhaps most famous for Newcastle Catholic Cathedral. The driveway of the school is now a new road, St Mary's Road, and this leads southwards to the considerable housing development on the former site of the school. 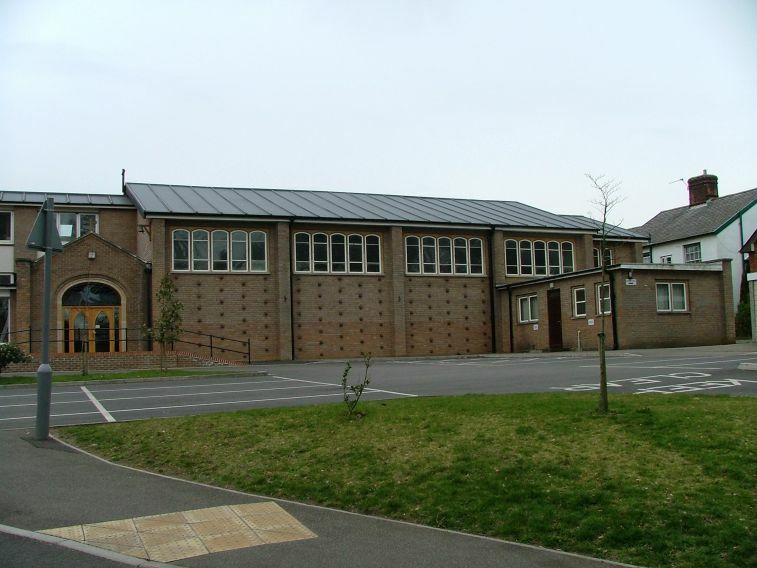 To the east of the road, beyond the new car park, is the modern St Mary's Catholic primary school. 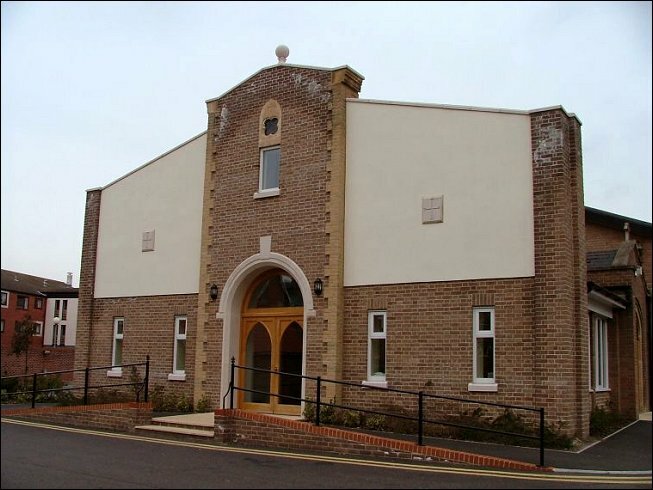 But if you follow the path to the right that rounds the presbytery, you will spot the east gable of an even earlier church, the 1827 St Anthony, now part of the parish hall behind the modern single-storey extension. This formed the transepts of the 1838 church, and some of the sanctuary fixtures are still discernible inside. Until demolition, Goldie's great gothic school stood imposingly ahead of us. It was identical in style to his unfinished Ipswich church, St Pancras, and was probably built as part of the same commission. The Convent of the Religious of Jesus and Mary relinquished management of the school in the 1970s, and it closed in 1996, moving in with St Joseph's College in south Ipswich. Now, you would hardly know that it had ever been there. All that survived the demolition was a large 1920s house used for administration, and some modern offices. All of Goldie's work was completely destroyed. But it is the neat brick church to the west of the site that we have come to see. It was built in 1960, to celebrate the centenary of the arrival in this country of the Religious Order of the Sisters of Jesus and Mary. 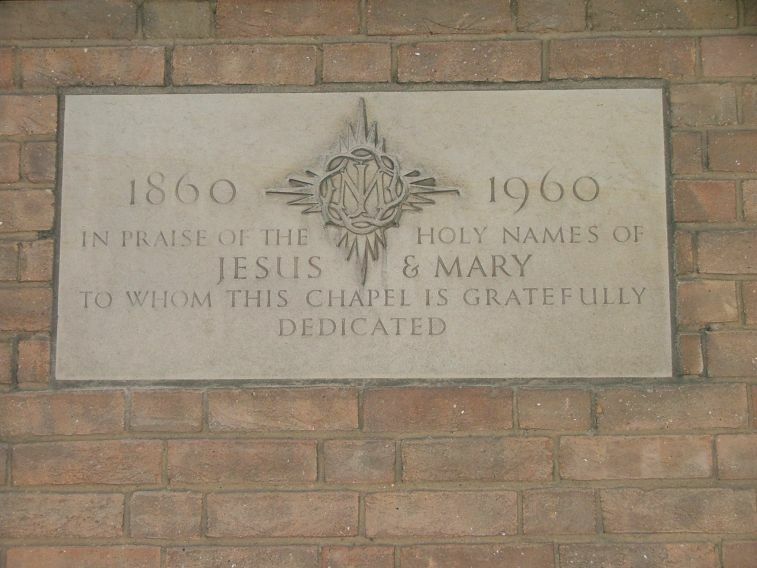 It was built as the convent school chapel, and a plaque in the galilee porch records its opening. Above the east entrance, the traditional liturgical south, the Holy Spirit descends in glass, in the form of a dove. The only other stained glass is in the old church, a Polish devotional window to Our Lady of Czestochowa - this parish is the centre of the local Polish community. A modern entrance at the south end was completed in 2003 to front the old schoold offices, which were subsumed into the church and now contain a bookshop, repository, meeting rooms and a display area. You step through doors into a space that seems much larger than possible from the outside - probably because of the low pitch of the roof, and a sense that the ghost of Goldie's imposing school still dwarfs over the modern building. One of the first things you notice is that the church still retains the Religious order's cross above the chancel arch, and the RJM motto Laudentur Semper Jesus et Maria ('Let us Always Praise Jesus and Mary') behind the altar. This might almost still be a school chapel. The overwhelming sense is of warm wood, with cool, classical white beyond. There are banked seats on each side, originally for the sisters. 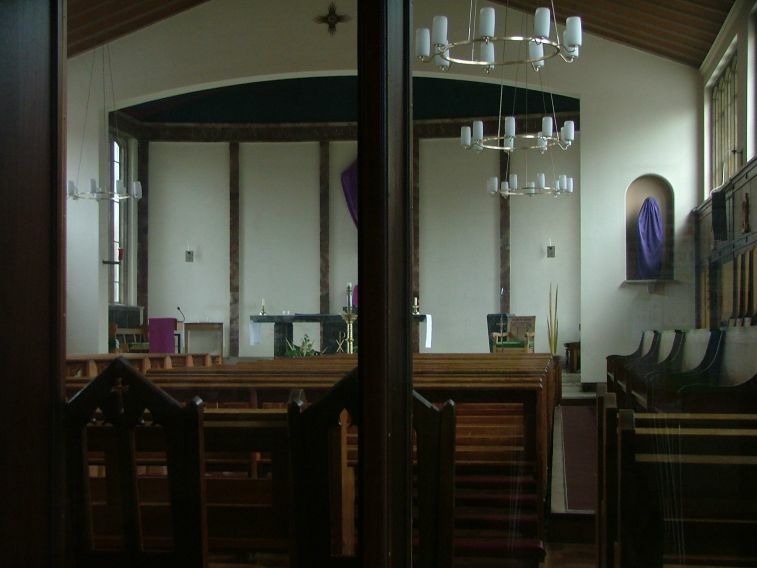 These are in groups, each with three seats at the back, and a bench in front, and are consequently popular at Mass with family groups. This building became the parish church in 1976, and, technically speaking, is still dedicated as 'the Chapel of Jesus and Mary'. At that time, the old church was already too small for the life of the Parish, and inappropriate for the liturgical demand of the post-conciliar Church. The second might also be said of this 1960 building, but it is much more flexible, and suitable. 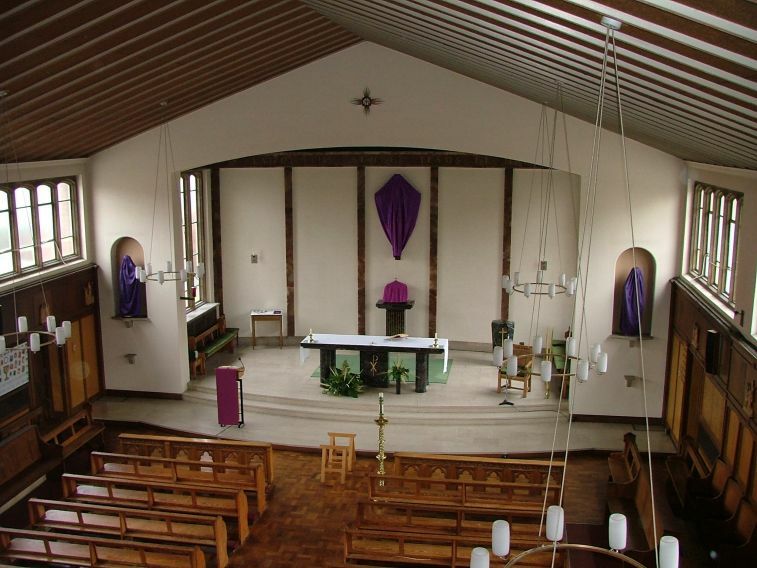 The sanctuary, for instance, is successfully grand but simple, in keeping with the modern Catholic Church. The marble altar within the archway has clean, bold lines, but is grand enough to command the space. Behind it, thin lines of marble echo Suffolk Perpendicular, with the Latin motto along the top of them, run vertically up the walls, creating a sense of an apse in the slightly curving wall. 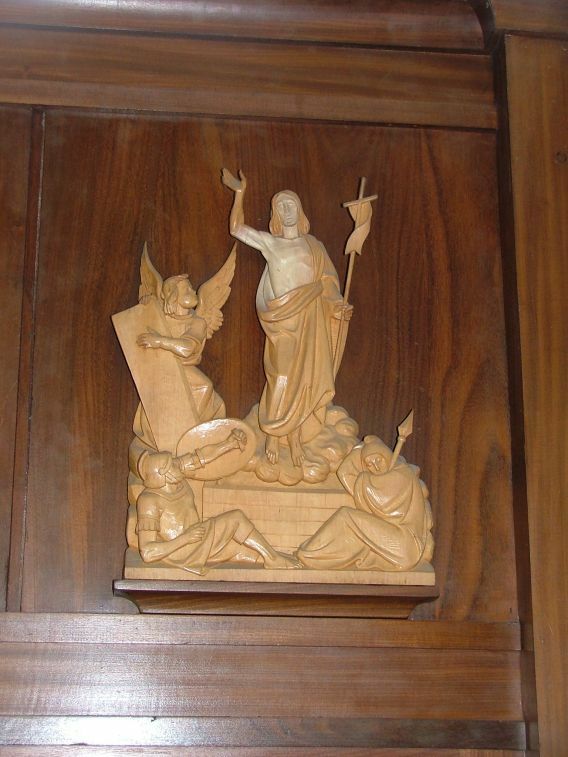 A crucifix is placed simply in the middle. There is a similar feel to the Anglican church of St Francis across town, built three years earlier and with similar echoes of Suffolk Perpendicular. The shallow steps, and the opening out of the roof behind the archway, draw the eye to the centrality of the crucifix and tabernacle beneath it. 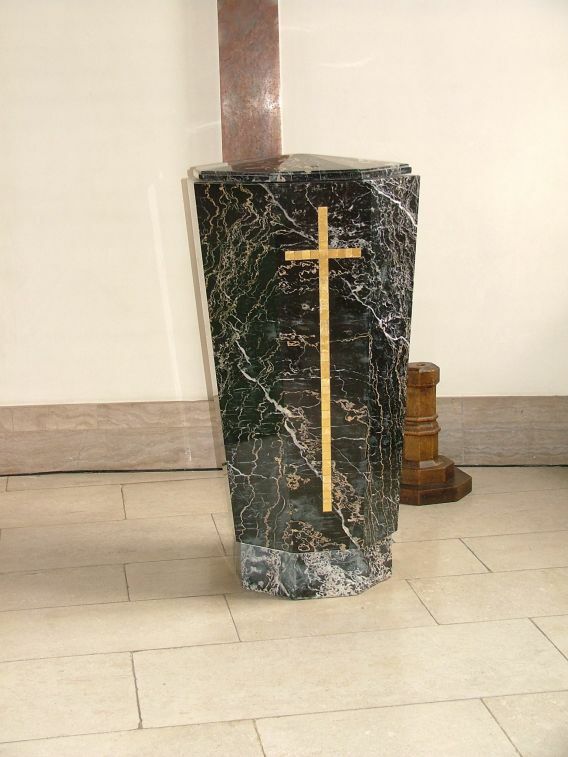 To the right of the tabernacle sits the former font, which is no longer used. Instead, an earthenware basin is placed in a more central position, in front of the altar. 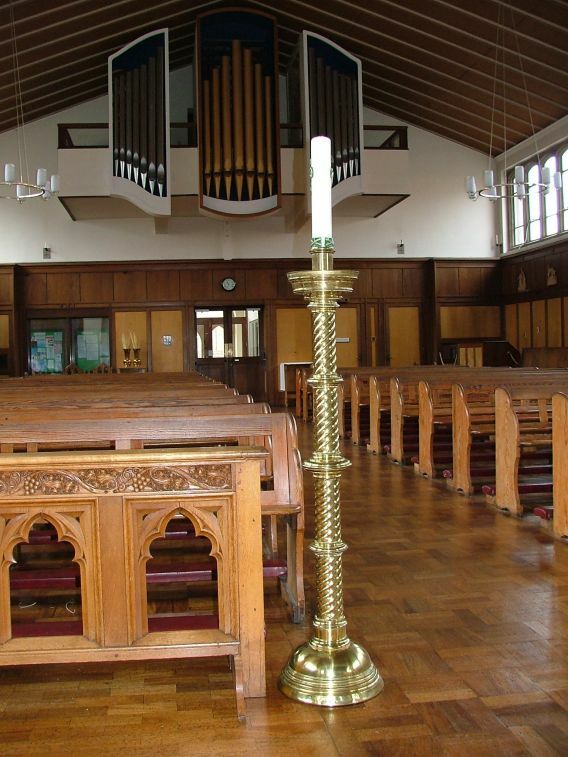 The nave is ordinary in comparison, perhaps, but the use of different kinds of wood for the parquet floors, panelled walls and bench seating creates a unity, and a warmth, unusual in a modern church. 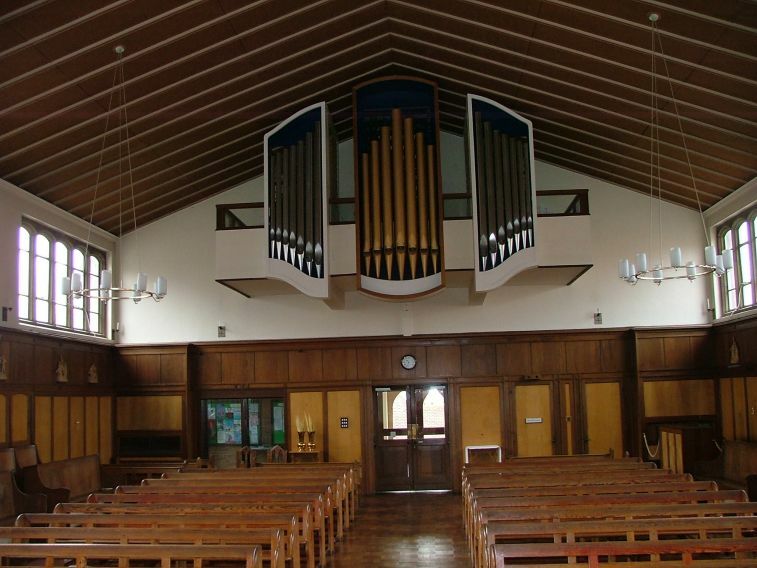 A small organ sits in the north-west corner, and above it on the balcony, are decorative organ pipes. There are sacristies either side of the chancel arch. As I said, this church was designed for pre-Vatican II worship, and if it had been built five years later, perhaps, it would have been a bit different. 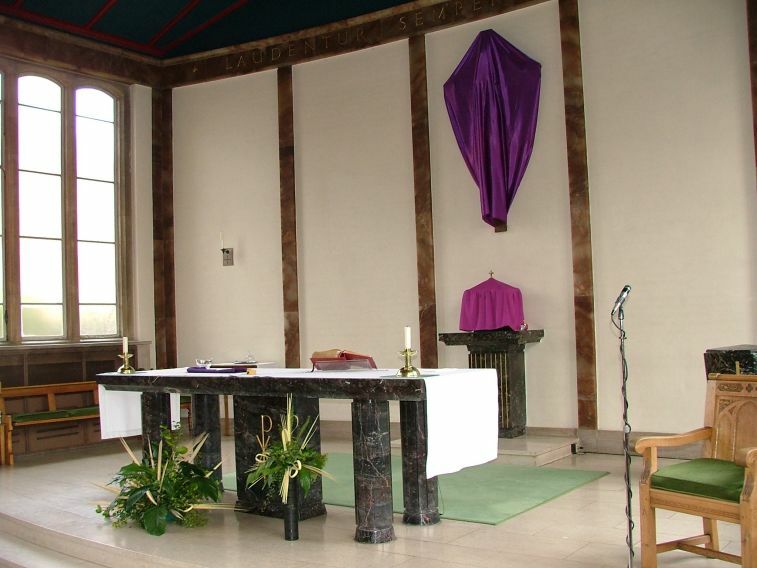 But it is a most pleasing space, if a little awkward for some aspects of modern liturgy. The nave windows also echo, in their way, Suffolk Perpendicular, and it is rare for this church not to be filled with light. Further warmth is created by the display of banners, created by the various childrens' groups. 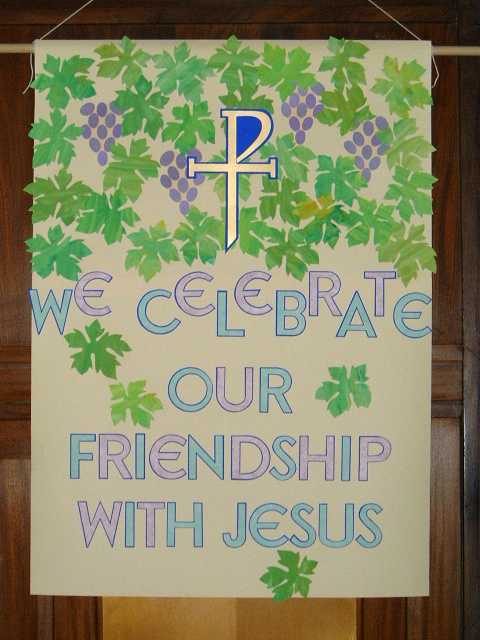 Currently on display at St Alban's Catholic High School, but originally created for this church, are a series of banners designed by the late Sister Cecilia RJM. These intertwine imagery of the Holy Spirit with images from life of the parish. The organ is a fine one, recently updated to provide an instrument of the highest quality. 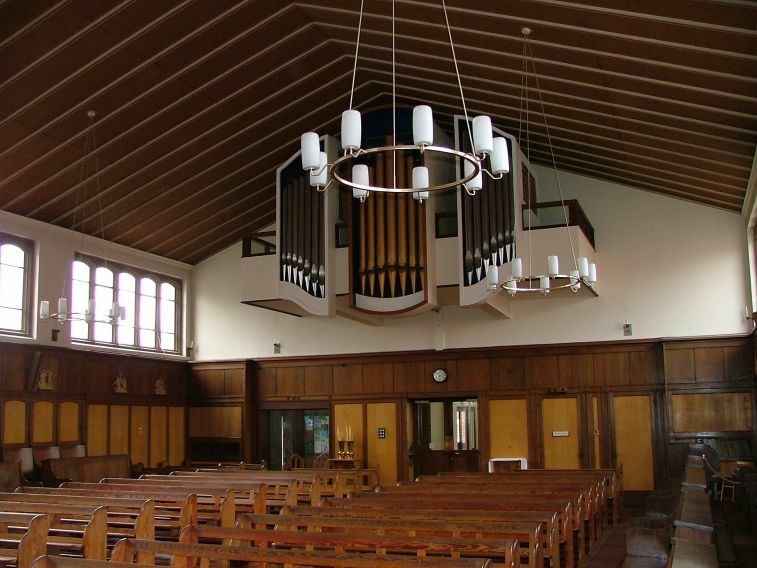 Unfortunately, this necessitated feeling the former balcony with organ pipes, which reduced the capacity of the building, although it has to be said that use of the balcony was always difficult because of the safety issue. If you leave the church through the south doors at the liturgical west, you find yourself stepping through the magnificent classical frontage created in 2003 after the school was demolished. This is the side that you see in the photograph at the top of this page. 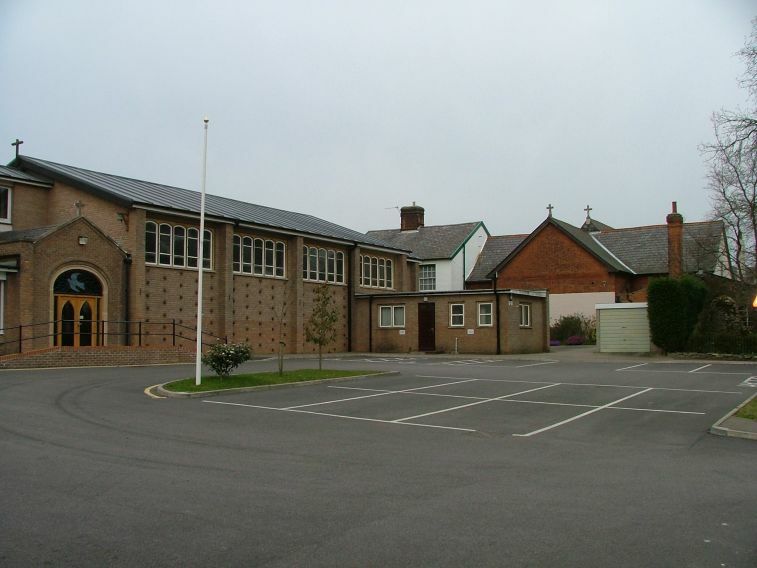 With its wide car park around it, it is hard to recall that the church was pretty well hemmed in by the three storey red brick buildings of the school before demolition. Across the car park, to the north, you can see the sanctuary end of the 1838 church, although it is not generally open. The garage in front of it would, perhaps, not get planning permission today. But this is a small detail. As with many modern Catholic churches in East Anglia, St Mary is no longer really big enough for the congregation it attracts. The church holds barely 300 people, and yet in the course of four Sunday Masses, one in Polish, almost 900 people manage to find a place here. Some people prefer to stay out in the porch, which has a large glass window into the church, and loudspeakers which relay the Mass. As well as the Polish Mass, there is also a regular Malayalam Mass, because the Parish is home to a large and devout Catholic South Indian community, and at Christmas, Easter and Holy Communions it is always standing room only here. In an age when the harbingers of doom wish the Church into history, here is a massively thriving parish, with two schools and a chapel of ease at Holy Family and St Michael, Kesgrave. 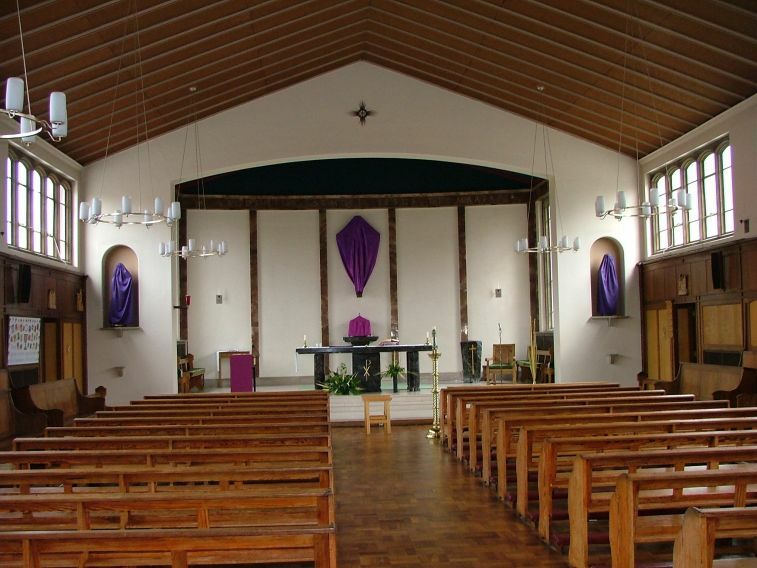 It fulfills its role as the mother parish of Catholic Ipswich, and, after St Edmund in Bury, the largest church congregation in Suffolk.